A recent issue of USA Today delivered remarkable advice on “how to know if you've breathed ricin” in a biological attack: “ .. a large number of people close to you suddenly develop fever, cough and excess fluid in their lungs.” One might suspect flu in the office first because ricin has never been used in such an attack and while terrorists have shown interest in the material, castor beans and castor plants, they have shown little or no capability in making it into an inhaled weapon. Nevertheless, it is a sign of the times and accompanying wisdoms that many believe such a thing likely, so likely that authoritative sources regularly offer, at best, conjectural advice on what to look for and what to do. There is an antidote – a vaccine -- to such groupthinking. It is Milton Leitenberg's “Assessing the Biological Weapons and Bioterrorism Threat,” published by the Strategic Studies Institute of the US Army War College. Leitenberg, a scholar and expert on arms control at the University of Maryland, writes “For the past decade the risk and immanence of the use of biological agents by nonstate actors/terrorist organizations -- 'bioterrorism' -- has been systematically and deliberately exaggerated.” He immediately adds this practice “accelerated” after 9/11 and the mailings of powdered anthrax. The first part of Leitenberg's book examines the development of national bioweapons programs, a discussion which dovetails seamlessly into an exploration of what is definitively known about terrorist organizations and what is known of their capabilities. He documents four “significant” bioterror events: usage of the salmonella bacterium to contaminate food in Oregon, Aum Shinrikyo's “unsuccessful” work in the production of anthrax and botulinum toxin, al Qaida's “unsuccessful” efforts toward obtaining anthrax and the “successful” use of the same in the Amerithrax mailings. Upon this small clutch of samples, an assortment of bioterrorism experts, lawmen, security advisors, national political figures and academics have built the fancy that such attacks are easy and one of the most catastrophic threats faced by the American people. Leitenberg dissects this fraud, and that is not his word, but mine. Because a fraud, and a substantial one, is what it is. The elements of it are displayed in page after page in Leitenberg's precise recapitulation of public statements, claims made to the media and allegedly expert analyses, showing his readers who dissembled and where the rotten bodies are buried. Of note is Leitenberg's dissection of the process of assessment as practiced through bioterrorism threat scenarios conducted by the US government and private think tanks. Exercises like Dark Winter, which modeled an “aerosolized” smallpox attack, Top Off 2 and 3, both on pneumonic plague strikes, and Atlantic Storm, an exercise that purported to show an al Qaida group manufacturing a dry powder smallpox weapon, were rigged. In the cases of Dark Winter and the Top Offs, transmission rates of disease were sexed up beyond historical averages so that “a disastrous outcome was assured” no matter any steps taken to contain outbreaks. Eight pages are reserved to pointedly condemn the Atlantic Storm exercise on a host of sins which can generally be described as a bundle of frank lies and misinformation coupled with a claimed terrorist facility for making smallpox into a weapon that even state run biological warfare operations did not possess. And once again, juiced transmission rates of disease were employed to grease theoretical calamity. The reader comes to recognize the deus ex machina – a concoction or intervention added to dictate an outcome, in these cases very bad ones – as a regular feature of the exercises. However, the results of the same assessments – the alleged lessons learned -- have never been reported with much, if any, skepticism in the media. Readers also know that Leitenberg is a colleague and while I share his critical view in many of these matters, we independently came to them through research efforts which overlapped. Leitenberg discusses two of these instances. The first was the case of the notorious London ricin terror ring. Used as a plank in Colin Powell's infamous case for war against Iraq before the UN Security Council, the London ricin ring was alleged to have been connected to terrorist mastermind al Zarqawi in the north of Iraq. In fact, this was not true and no ricin was ever produced by the one man, Kamel Bourgass, convicted in the case. However, through a series of events that have never been adequately recounted in the British or US mainstream media, what was originally a false positive ricin detection in an apartment in London was not reported until the end of the Bourgass terrorism trial in April of last year. In fact, Porton Down, through the utter confusion of one of its employees, had reported the opposite to British authorities – and by extension US sources . Although the experts knew a mistake had been made, no effort was made in correction until March 20th 2003 – the day the war started. British authorities did not hold a press conference to announce it and there was no contemporaneous news on the subject, most likely because the truth was overtaken by events and inconvenient. As a result, the London ricin ring enjoyed a large footprint in the public and academic record on how Islamic jihadists have attempted to use it as a weapon of biochemical terror, not as an example of failure on the part of a demonstrably incompetent loner. And it is still regularly misinterpreted and misrepresented by terrorism experts and newsmen. In the second case, Leitenberg and this author collaborated in critiquing and deflating the much-hyped summer of 2005 assessment that botulism toxin could be easily put into the nation's milk supply, where it could kill half a million people. After absorbing the details of threat assessment and what is known of terrorist capabilities, the reader is presented with Leitenberg's conclusions. First is the shameful fact that the threat of bioterrorism has been framed, the rationalization for which is that “political action, the expenditure of public funds for bioterrorism prevention and response programs, will not occur without it.” This is “not benign,” the author continues. It has been noted by terrorists and “is the single greatest factor” in their strivings for biological weapons. Another problematical breakout is offered in a proposal by two scientists to study the “aerobiological” characteristics of the lethal Marbug and Ebola viruses. Such a study looks to define how the organisms can be aerosolized, an instance of research into examining a vulnerability in the complete absence of a verified threat. It is just such work that could convince others not in the US biodefense research establishment that this country has simply reentered the biowar research business using a semantic argument as cover. And a third example, similar in nature but not included in Leitenberg's book, is the work on development of a ricin vaccine. Once again, in the absence of a practical threat the US government and collaborators in private industry and academia have aerosolized the toxin anyway for the sake of the research. In relating this state of affairs, Leitenberg's book leaves the reader asking what should be done to clean up the mischief and harm. His advice, in the form of detailed policy recommendations, is urgent and convincing in its logic. He proposes a national threat assessment in which analysis is based on what is actually known about national and terrorist bioweapons capabilities. Analyses based on hypotheses about what is capable based on state-of-the-art abilities and technology, the practice that currently holds sway, should not trump reality-based reasoning. Second, government officials should stop exaggerating the threat of bioterrorism. The rhetorical pumping up of the danger has had a demonstrably negative effect on national security by actually stimulating the interest of others in acquiring biological weapons. Third, dollar expenditures under Bioshield I and II for vaccines to “select” biowarfare agents should instead be turned toward vaccine work on pandemic influenza. Final recommendations include the country reinvigorating its commitment to the Biological Weapons Convention and immediately enacting a “serious” regime of oversight for biodefense research programs. Leitenberg's “Assessing the Biological Weapons and Bioterrorism Threat” is a sobering read and highly recommended to anyone interested in the subject of bioterrorism. Better, you can download it immediately from the Internet. “The National Center for Biodefense was established ... in 2001 to promote awareness of the national and international security challenges and medical and public health threats posed by biological terrorism ... It's scientists are engaged in innovative research...” reads a press release from George Mason, a Virginia university located near Washington, DC. In 2005 alone, the university received a 25 million dollar grant from the US government to build a biocontainment and research facility for biodefense work. However, since defecting to the US in 1992 his research has been in into providing protection against disease rather than developing ways to cause it. “This is evidence of the caliber of bioscience research out-of-the-box thinking that is going on at George Mason” said Charles Bailey, the director of the school's National Center for Biodefense, in the same press release. National Security Notes could not find such remarkable smallpox/AIDS therapy patents credited to Alibek or Weinstein in the US patent database. Another patent application, 20040018193 , submitted by Alibek is entitled “Rapid acting broad spectrum protection against biological threat agents.” Dated from January of 2004, it is for a therapy to treat smallpox – a viral infection, and anthrax, a bacterial one, with a large admixture of materials including antibodies, antibiotics and the cell walls of bacteria and the “peptidoglycan, lipoteichoic acid, or muramyl peptide fraction of bacterial cell walls.” In addition, it appears to be patent application to cover a manner of cipro administration in anthrax infections. “This invention was made with Government support under MDA972-01-C-0084 awarded by [Defense Advanced Research Progam Agency – DARPA] and DAMD17-01-C-0033 awarded by the Department of the Army,” states the patent application. Keep in mind the bacterial cell wall, peptidoglycan and lipoteichoic acid part. In 2002, Alibek had his name on bottles of pills called “Dr. Ken Alibek's Immune System Support Formula,” sold off the website dralibek.com. (Since lapsed, the website, along with drkenalibek.com and kenalibek.com, can be found in the Wayback Machine, www.archive.org.) A brief for Science magazine wrote of it that Alibek “says the pills have nothing to do with his research on how the body can fight off bioterrorist agents.” For Science, Alibek said he was acting as a consultant to Vital Basics, the company marketing “Dr. 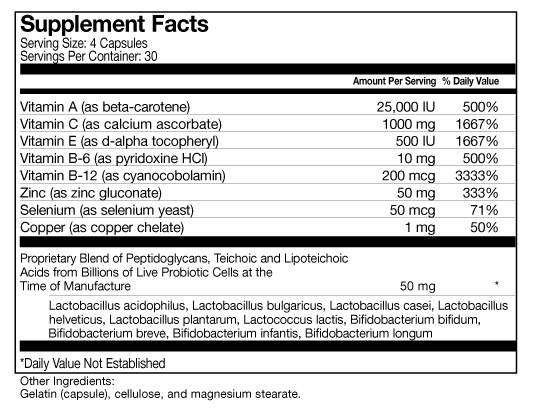 Ken Alibek's Immune System Support Formula.” Another scientist called it snake oil. 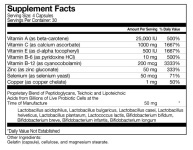 A close look at the Alibek pill bottle back label displayed by dralibek.com shows that in addition to vitamins, there is listed a “proprietary blend,” an admixture of ingredients, including “peptidoglycans, teichoic and lipoteichoic acids” from billions of bacterial cell walls. One difference among others between Alibek's DARPA supported patent application is that the potential bacterial cell wall mixtures as anti-bioterror therapies underwritten by DARPA and the Army are to be administered nasally while the pills were offered as a nutritional supplement. “[Ricin] is readily available [and] easy to disseminate” was the claim in a February edition of the Frederick Star-Post newspaper. Delivered in an article telling of the award of a patent to ricin vaccine developers at the U.S. Army Medical Research Institute for Infectious Diseases, it followed previous articles on the agency's ricin vaccine work, stories in which various parties never fail to stress how easy ricin is to get and make into a weapon. However, historically, ricin – in the great scheme of things – has killed virtually no one. This reality has not discouraged the US from developing not just one but two ricin vaccines. It is said this will serve to deter terrorists from using ricin. However, a small but constant number of young American men on the fringes of society have never received the message. They are not deterred in their interest in ricin recipes, an interest reinforced and whetted by all the times they have read, seen or heard on the news that ricin is easy to make and that recipes for it are easily downloaded from the Internet. In the case of ricin biodefense work, it is clear that exaggeration on ricin – delivered to make general points about bio or chemical terrorism, or in this case, how very necessary vaccine development is – stokes the interest of people wishing to stockpile a chemical/biological weapon in their home. As a result, the law arrests a number of people, usually men, each year, and bangs them up on charges of possession of ricin or attempting to create a biological weapon, putting them away for varying amounts of time. Common features of the cases are stupidity, possession of castor seeds, an impure mash of castor seeds and recipes for ricin of the kind found on the Internet. And the historical record is clear in that it shows that in such cases ricin is not purified. The only thing that is done is the conversion of beans to a powder that may or may not be free of castor oil, a material that in the US had historical use as fertilizer. “Cutler wanted to have ricin available and package [sic] in such a way that future assailants would ingest the ricin believing that it was a quantity of narcotics.” In other words, Cutler kept bad company for friends, people who did drugs, and they had rolled him for something. And here is where it gets weird. Yet castor oil contains no ricin and Cutler could not have prepared it no matter how much he may have wished to. And acetone is used to degrease – that is, to remove castor oil – from castor mash, not to leach ricin from it. Nevertheless, Cutler pled guilty to a count of attempted production of a biological toxin for use as a weapon even though he had no materials that granted him the potential to do so -- even by accident. It was a crime with a potential for two and a half to five years in prison. Court records accompanying the plea indicated that an evaluation of Cutler's mental status had been submitted to the court, possibly as part of a planned insanity defense. He is scheduled to be sentenced in April. NSN is not a legal expert but it is interested in knowing what these facts reveal about the qualities of justice and defense counsel in this case, if anything. Cutler, who was 25, lived in a Mesa apartment with a roommate who turned him in to authorities because he thought he had been poisoned. Authorities then arrested Cutler and tested a vial kept around his neck – the package – for ricin and the test by the National Laboratory Response Network returned a positive. Since Cutler did not have castor seeds, it was a false finding and subsequent retests of fifteen samples were all negative. Authorities and scientists blamed unspecified reagents used in the initial determination. The astute reader may grasp that Cutler, who appears to have been incompetent, was found guilty of wanting to produce ricin, failing, but having a ricin recipe and thinking mean thoughts and plans about acquaintances he felt had done him wrong. Other items seized as evidence and tallied in court documents included a number of firearms, “a ricin document” attributed to the Intermet, “The Anarchy Cookbook,” “The Unabomber Manifesto,” a “Assorted Ways to Kill Someone” document, a “Common Poisonous Plants” document, and the books or pamphlets, “Explosives and Demolitions,” “Guerilla Warfare,” and “Encyclopedia of Terror.” Many of these items are reasonably common on scattered websites, usually maintained and patronized by young men like Casey Cutler and Ekberg. Ekberg was sentenced to 28 months in prison. One final case that is pending involves the survivalist/outdoorsman, Denys Ray Hughes, who maintained an apartment in Phoenix and a cabin in Wisconsin. Involved in an investigation after a traffic stop in Kansas, federal and local lawmen subsequently searched his apartment and cabin. In Wisconsin materials were found commonly implicated in attempts to purify ricin. These "were not mixed, no process started, no finished product, no setup, no lab, nothing," said the local sheriff to Associated Press in July of last year. A copy of the complaint against Hughes describes items likely to attract the attention of the ATF and seen in Hughes' car or seized in searches. These included gunpowder, fuses, road flares, instructions on how to build a bunker, an assortment of guns, silencers and pipe-bomb-building materials. An unspecified “clandestine manufacturing process was discovered” in the Wisconsin cabin. The search was not completed when the complaint was filed and after completion bottles of castor beans, recipes for ricin, and dimethyl sulfoxide (DMSO), a compound which is included in the infamous Maxwell Hutchkinson procedure for the poison, were recovered. Hutchkinson suggested in his “Poisoner's Handbook” (Loompanics) that ricin could be put in DMSO to make it penetrate the skin, an error which has migrated into Internet recipes for it as well as survivalist/neo-Nazi and al Qaida/jihadist literature. Ricin is not a contact poison. “Terrorists Turn to the Web as Base of Operations” was the headline of a big Sunday feature in the Washington Post in August of last year. For the story, the Post trotted out documents that had been recovered and translated from jihadist websites, purporting to show their facility in training each other in the ways of biological weapons. The power of such stories lies primarily in the fact that most people never actually see the documents in question. They just get the juicy bits, the threatening implications and language. However, “Biological Weapons” was no training manual. It was a cut and paste of materials from introductory determinative microbiology lab texts on plague and botulism, also containing some of the usual laughers common to alleged jihadist literature of this kind. In its section on botulism appended to its first section on plague, the belief that botox is easily obtained – common to jihadist and domestic survivalist documents – is delivered along with the usual script that it is to be simply gotten from the excrement of grass-eating animals, upon which it will be mixed with dirt and cultivated, whereupon it will become liquid. At one point the author muses that such a poison could be smeared on the shoes and legs of someone going off for a suicide operation which only makes sense if the suicide mission involves getting people to lick the feet of the jihadist. It is a sad state of affairs when readers of the news are given wind of bioterror yearnings in jihadists sans the silly parts which enable an immediate and accurate assessment of their know-how, know-how usually at odds with what is delivered in the same article. It is doubly concocted when one is not informed that such jihadist documents aren't sought out by journalists but shopped by a small number of private sector intelligence-gathering organizations in the DC area wishing to call attention to lurking menace. NSN knows this because a month or two later it was asked to look at a copy of “Biological Weapons” for a similar potential story by another newspaper just as big as the Washington Post. Of course, when the news is bad on al Qaida and bioterror it always finds its way into print. However, when the interpretation is more realistic, as NSN delivered, you don't get to read about it. No story here, folks, move along. National Security Notes welcomes letters. E-mail them to George @ vmyths.com. Published letters may be edited for brevity and clarity. Although National Security Notes is not yet delivered by listserv, you can subscribe by e-mail anyway and count on not missing an issue. Simply send a request to be added to George@vmyths.com. National Security Notes is edited in Pasadena, California, by George Smith, Ph.D. who is many things, including a protein chemist and a Senior Fellow at GlobalSecurity.Org.